Have you ever met a leprechaun or found a pot of gold at the end of a rainbow? Here’s a few facts about leprechauns you might have never known! #1 Did you know you can catch a leprechaun? 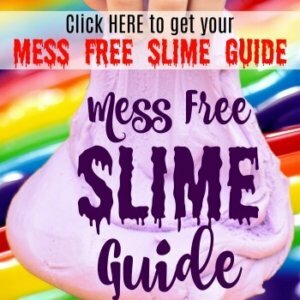 You can make a trap with your children. First, you need something shiny like gold coins to lure and then create a trap out of an old shoe box. #2 Just like me, The TipToe Fairy, leprechauns are actually fairies! Did you know? I had no idea! #3 They’re sneaky, but they can be very generous if you are kind. In one legend, a man gave a leprechaun a ride on his horse and found his castle filled with gold all the way to ceiling! #4 There are no girl leprechauns. Some people think leprechauns were just the bad ones thrown out of the fairy world, which might explain why there are no lady leprechauns. #5 Leprechauns are the bankers and cobblers of the fairy world. They love to craft little shoes, and they are in charge of the treasure from the entire fairy world! 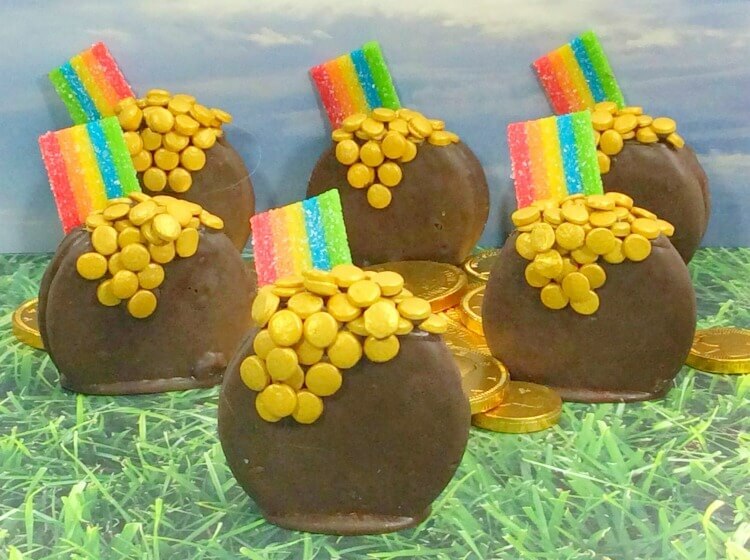 Maybe one of these Pot o’Gold cookies might just lure a leprechaun out for you! Freeze a water bottle into the freezer for about 30 minutes to an hour beforehand. While that’s freezing, melt the chocolate wafers in the microwave in 30 second increments. Stir after each 30 seconds, and keep heating and stirring until the chocolate is completely smooth and melted. Once melted, dip an OREO into the chocolate. Then use a fork to flip it over so that it’s totally coated. Use the fork to carefully pick it up and lightly tap it on the edge of the bowl to get rid of the excess chocolate. Then, place it on parchment paper on a cookie sheet. Do this with the rest of the OREOs. Pop the cookie sheet into the freezer for 10-15 minutes until the OREOs are completely hardened. Then, cut off the top and bottom of each OREO to kind of square it off. This way you’ll be able to stand it upright. Now dip the bottom or the OREO in the chocolate and lightly shake off excess. Place the OREO standing upright on the parchment paper. Do this with the remaining OREOs. Once the bottoms have hardened, slightly dip the top of each OREO into the melted chocolate. Then work quickly but carefully place the gold sequin sprinkles on the top where the melted chocolate is. 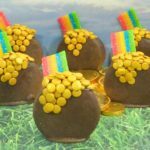 Use tweezers to dip the back of the gold sequin sprinkles into the chocolate to glue them on top of the ones already on the OREO. Randomly place more sequins throughout the already placed gold sequins. Place more onto the center on the top and build up to make it look like a full pot of gold. Do this with each OREO. Now here’s the weird part — pull out the water bottle and put it on the cookie sheet. Next take the Airhead candy and cut each strip into thirds. Take each piece and spread some chocolate onto the bottom of the candy to act as a glue with a knife. Place the Airhead candy with the chocolate part onto the back of the OREO. Then, place the OREO against the water bottle to secure that piece of candy so it won’t fall off. Because it’s so cold, it will quickly harden the rainbow candy to the OREO. Repeat this with each OREO. 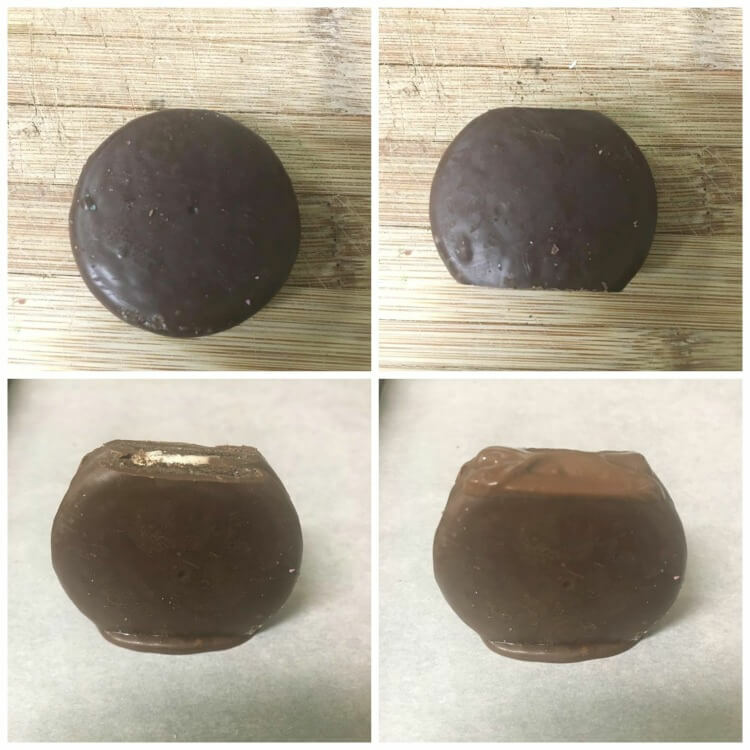 Melt the chocolate wafers in the microwave in 30 second increments. Stir after each 30 seconds, and keep heating and stirring until the chocolate is completely smooth and melted. Once melted, dip an OREO into the chocolate. Use a fork to flip it over so that it’s totally coated and then carefully pick it up and lightly tap it on the edge of the bowl to get rid of the excess chocolate. Place it on parchment paper on a cookie sheet. Do this with the rest of the OREOs. Pop the cookie sheet into the freezer for 10-15 minutes until the OREOs are completely hardened. Cut off the top and bottom of each OREO to kind of square it off. This way you’ll be able to stand it upright. Now dip the bottom or the OREO in the chocolate and lightly shake off excess. Place the OREO standing upright on the parchment paper. Do this with the remaining OREOs. Once the bottoms have hardened, slightly dip the top of each OREO into the melted chocolate. Work quickly but carefully place the gold sequin sprinkles on the top where the melted chocolate is. 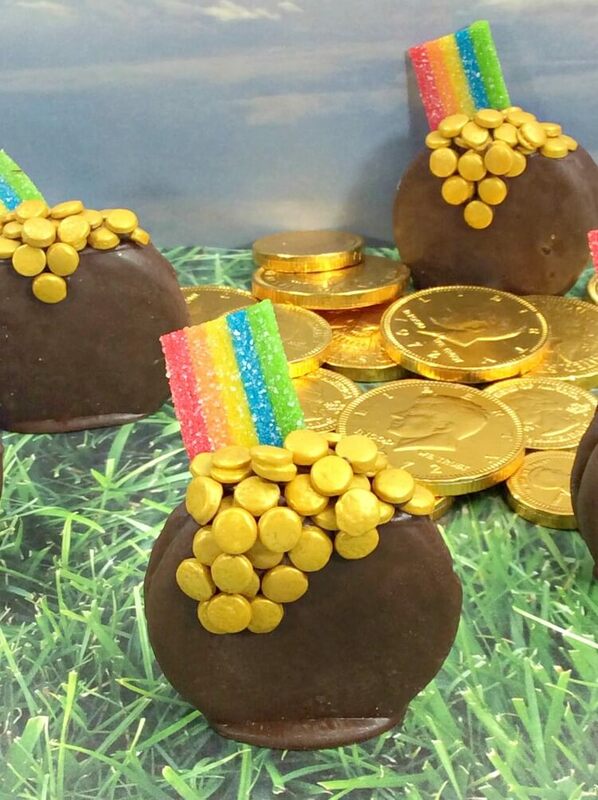 Use tweezers to dip the back of the gold sequin sprinkles into the chocolate to glue them on top of the ones already on the OREO. Randomly place more sequins throughout the already placed gold sequins. Place more onto the center on the top and build up to make it look like a full pot of gold. Do this with each OREO. Pull out the water bottle and put it on the cookie sheet. Next take the Airhead candy and cut each strip into thirds. Take each piece and spread some chocolate onto the bottom of the candy to act as a glue with a knife. Place the Airhead candy with the chocolate part onto the back of the OREO. Set the OREO against the water bottle to secure that piece of candy so it won’t fall off. 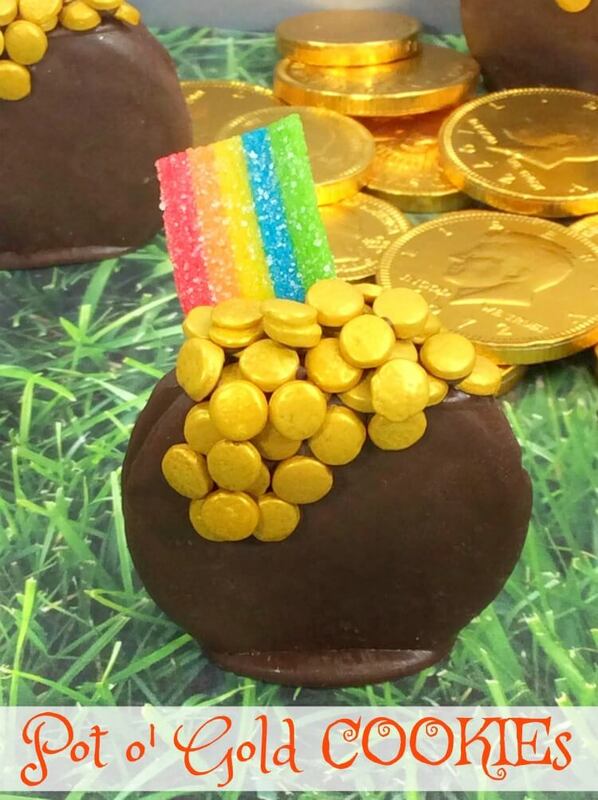 Because it’s so cold, it will quickly harden the rainbow candy to the OREO. Repeat this with each OREO.